Our work focuses on two channels: trade and net fiscal contributions to the EU budget. We present results using both a structural gravity trade model and reduced form empirical estimates. 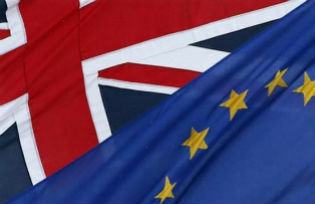 In both cases, we find that leaving the EU reduces living standards in the UK, although the exact magnitude of the loss is subject to considerable uncertainty as it is not known what policies the UK would adopt following Brexit. Membership of the EU has reduced trade costs between the UK and the EU not only through the removal of tariff barriers, but also through reductions in non-tariff barriers as part of the European Single Market. Reductions in trade barriers have increased trade between the UK and the EU. Prior to the UK joining the European Economic Community (EEC) in 1973, around one third of UK trade was with the EEC. In 2014, the 27 other EU members accounted for 45% of the UK’s exports and 53% of UK imports. EU exports comprise 13% of UK national income. Higher trade benefits UK consumers through lower prices and access to better goods and services. At the same time, the UK’s workers and businesses benefit from new export opportunities that lead to higher sales and profits and allow the UK to specialise in industries in which it has a comparative advantage. Through these channels, increased trade raises output, incomes and living standards in the UK. To estimate the effect of Brexit on the UK’s trade and living standards, we use a quantitative trade model of the global economy based on Costinot and Rodriguez-Clare (2013). Our model divides the world into 31 sectors and 35 regions. It allows for trade in both intermediate inputs and final output in both goods and services. The model takes into account the effects of Brexit on the UK’s trade with the EU and the UK’s trade with the rest of the world. To forecast the consequences of the UK leaving the EU, we must make assumptions about how trade costs change following Brexit. It is not known exactly how the UK’s relations with the EU would change following Brexit, so we analyse two scenarios: an ‘optimistic’ scenario in which the increase in trade costs between the UK and the EU is small, and a ‘pessimistic’ scenario with a larger rise in trade costs. The optimistic scenario assumes that in a post-Brexit world, the UK’s trade relations with the EU are similar to those currently enjoyed by Norway. As a member of the European Economic Area (EEA), Norway has access to the Single Market. But because Norway is not a member of the EU’s customs union, it faces some non-tariff barriers that do not apply to EU members, such as rules of origin requirements and anti-dumping duties. In the pessimistic scenario, we assume the UK is not successful in negotiating a new trade agreement with the EU and, therefore, trade between the UK and the EU following Brexit is governed by World Trade Organisation (WTO) rules. This implies larger increases in trade costs than the optimistic scenario. Under both scenarios we take a forward-looking view. We assume EU integration will continue over the next decade and the UK will benefit less from future integration if it leaves the EU. The ‘pessimistic’ scenario assumes integration continues at the same rate achieved over the last 40 years, while the ‘optimistic’ scenario assumes the speed of integration falls to half its historical rate. Our estimates also account for fiscal transfers between the UK and the EU. Like all EU members, the UK contributes to the EU budget. The net fiscal contribution of the UK to the EU budget is around 0.53% of national income (HM Treasury 2013). One benefit of Brexit for the UK would be a reduced contribution to the EU budget. But Brexit would not necessarily mean the UK would make zero contributions to the EU budget. In return for Single Market access, EEA members such as Norway make substantial payments to the EU. On a per capita basis, Norway’s financial contribution to the EU is 83% as large as the UK’s (House of Commons 2013). Therefore, in the optimistic case we assume the UK’s contribution to the EU budget falls by 17% (that is, 0.09% of national income). In the pessimistic case we assume the UK makes a bigger fiscal saving. Eurostat data shows that, after accounting for the money the UK receives back from the EU to fund research, firms and other non-governmental bodies, the UK’s contribution to the EU budget is 0.31% of national income. Therefore, in the pessimistic case, the UK saves 0.31% of national income. Table 1 summarises our results. For each case, we report the percentage change in income per capita that has the same effect on living standards in the UK as Brexit. In the optimistic scenario, there is an overall fall in income of 1.28% that is largely driven by current and future changes in non-tariff barriers. Non-tariff barriers play a particularly important role in restricting trade in services, an area where the UK is a major exporter. In the pessimistic scenario, the overall loss increases to 2.61%. The costs of reduced trade far outweigh the fiscal savings in both scenarios. In cash terms Brexit reduces average income per household in the UK by £850 per year in the optimistic scenario and £1,700 per year in the pessimistic scenario. Source: Dhingra et al. 2016a. Notes: Optimistic scenario: Increase in EU/UK Non-Tariff Barriers (+2%) + exclusion from future fall in NTB within EU (-5.7%), saving of 17% of 0.53% lower fiscal transfer. Pessimistic scenario: MFN Tariff + increase in EU/UK Non-Tariff Barriers (+6%) + exclusion from future fall in NTB within EU (-12.8%), saving of 0.31% net fiscal transfer. Following Brexit, the UK would no longer be bound by the EU’s common external tariff on imports. Proponents of leaving the EU argue the UK could benefit from this change by unilaterally removing all tariffs on imports into the UK. To study this unilateral liberalisation policy, we re-do our analysis with the additional assumption that the UK removes all import tariffs. Table 2 reports the results. We find that unilateral liberalisation reduces the costs of Brexit by 0.3 percentage points in both scenarios. But the overall effect of Brexit is still negative. The reason is that WTO tariffs are already low, so further reductions do not make much difference. In today’s world, integration is not a matter of lowering tariff rates. It requires policies, such as hammering out regulatory differences in services provision that rely on international agreement and cannot be achieved unilaterally. Notes: This includes simulating the unilateral removal of all tariffs on imports into the UK. The estimates in Tables 1 and 2 are based on a static trade model that does not account for the dynamic effects of trade on productivity. Recent research finds that dynamic effects may double or triple the size of the static effects reported in Table 1 (e.g. Bloom et al. 2014, Sampson 2016). An alternative way to evaluate the consequences of Brexit is to use the results of reduced-form empirical studies of the effects of EU membership. Baier et al. (2008) find that, after controlling for other determinants of bilateral trade, EU members trade substantially more with other EU countries than they do with members of the EEA or EFTA. Their estimates imply that, if the UK leaves the EU and joins EFTA, its trade with countries in the EU will fall by about a quarter. Combining this with estimates that a 1% decline in trade reduces income per capita by between 0.5% and 0.75% (Feyrer 2009) implies that leaving the EU and joining EFTA would reduce UK income per capita by between 6.3% and 9.5%. These estimates are much higher than the costs obtained from the static trade model, suggesting that the dynamic gains from trade may be important. Baier, S. L., J. H. Bergstrand, P. Egger and P. A. McLaughlin (2008) ‘Do Economic Integration Agreements Actually Work? Issues in Understanding the Causes and Consequences of the Growth of Regionalism’, World Economy 31(4): 461-97. Bloom, N., P. Romer, S. Terry and J. Van Reenen (2014) ‘A Trapped Factors Model of Innovation’, Centre for Economic Performance Discussion Paper No. 1261. Campos, N., F. Coricelli and L. Moretti. (2015) ‘Economic Growth and Political Integration: Synthetic Counterfactuals Evidence from Europe’, mimeo. Costinot, A., and A. Rodriguez-Clare (2013) ‘Trade Theory with Numbers: Quantifying the Consequences of Globalization’, CEPR Discussion Paper 9398. Crafts, N. (2016) ‘The Growth Effects of EU Membership for the UK: A Review of the Evidence’, University of Warwick mimeo. Dhingra, S., H. Huang, G. Ottaviano, J.P. Pessoa, T. Sampson and J. Van Reenen (2016a) ‘The Costs and Benefits of Leaving the EU: Trade Effects’, Centre for Economic Performance Technical Report. Dhingra, S., G. Ottaviano, T. Sampson and J. Van Reenen (2016b) ‘The Consequences of Brexit for UK Trade and Living Standards’, Centre for Economic Performance Brexit Analysis 02. Feyrer, J. (2009) ‘Trade and Income – Exploiting Time Series in Geography’, NBER Working Paper No. 14910. HM Treasury (2013) ‘European Union Finances 2013’, 19th November. House of Commons (2013) ‘Leaving the EU’, Research Paper 13/42, 1st July. Sampson, T. (2016) ‘Dynamic Selection: An Idea Flows Theory of Entry, Trade and Growth’, Quarterly Journal of Economics 131(1): 315-80, 131(1): 315-380.